Durable taper thread fittings exceed the 72-hour salt spray test. Fittings feature a dirt-excluding ball check. 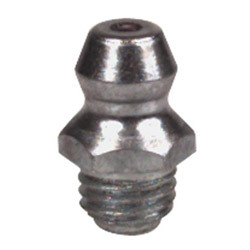 Trivalent zinc plating for extra durability. RoHS compliant. Style/Type: Coupler; Pressure: 10,000 psi; Power Type: Manual; Material(s): Metal. Grease Fittings from Alemite! 1980 In Stock today.